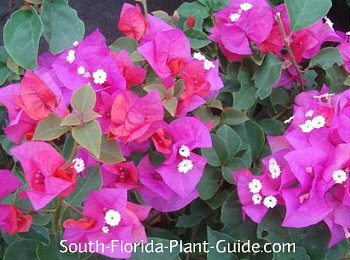 Dwarf bougainvillea provides glorious color to your landscape without the rampant growth of full size varieties. The most well-known dwarf variety is Helen Johnson bougainvillea. 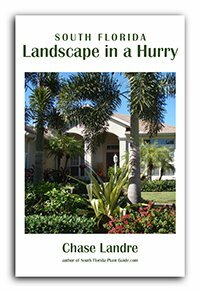 This is a versatile and hardy shrub you can keep trimmed to 3 feet. The blossoms are bright pink with a hint of purple, and newly opening flower bracts have a slight pink-orange tone. A newer cultivar that stays smaller and more compact is Sunvillea. Flower colors are pink - a soft salmon-pink, rose - a dark pink bordering on purple, and white - with a touch of creamy yellow. These shrubs are small enough to work as front-of-the-border plants. Dwarf bougainvilleas have thorns but because they're smaller overall than full-size varieties, they won't tear you to bits. Sunvilleas (like the Pixie variety, covered under the 4-6' Shrubs section) have dense foliage that covers up the thorns on their stems. Bougainvilleas bloom on and off all year - even in winter. 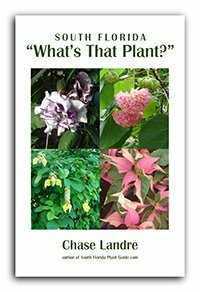 The flower of any bougainvillea plant is actually the tiny white blossom...the colorful parts are the flower bracts that encircle the little white blooms. The size of a dwarf bougainvillea depends on the variety. Helen Johnson is best kept trimmed to about 3 feet, while the miniature Sunvillea (left and below) can be kept a bit smaller. Bougainvilleas are moderately salt-tolerant, fast growers that need full sun to flower heavily. 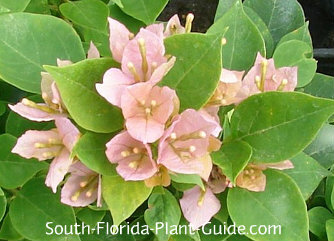 They're cold tolerant and do well anywhere in South Florida. Add a mixture of composted cow manure and top soil or organic peat moss to the hole when you plant. Dwarf bougainvillea care requires occasional trimming to shape, especially the Helen Johnson variety which can grow somewhat leggy. After each bloom cycle, cut each stem back at least several inches past the bloom area. Sunvillea is more dense and mounded, needing less trimming. Fertilize after each bloom cycle with a top-quality granular fertilizer high in phosphorus to promote flowering. You can supplement feedings with bone meal and/or liquid fertilizer as well. These shrubs are drought-tolerant but do best with regular waterings timed to let them dry out in between. Plant Helen Johnson 2-1/2 to 3 feet apart. Because this variety can grow longer branches, place it far enough away from foot traffic and play areas so thorns aren't a problem. Sunvilleas can go as close as 1-1/2 to 2 feet apart. 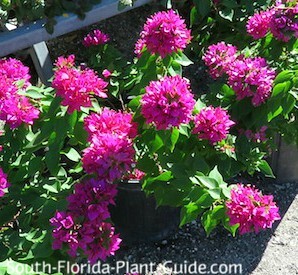 Dwarf bougainvillea, especially Sunvillea varieties, make excellent container plants. 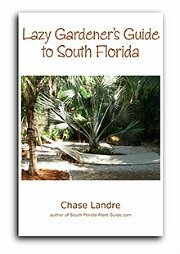 COMPANION PLANT SUGGESTIONS: Plant with other sun-lovers that like it on the dry side, including crown of thorns, dwarf clusia, clusia guttifera, Knock Out rose, juniper, podocarpus, and carissa.